It's true, the BlackBerry PlayBook is weird in some ways. You have to tether to your BlackBerry to get your calendar or email. But it's also pretty great. It's sort of the idealized seven-inch tablet, so dialed in it might be generic if it wasn't so cleanly executed. As thin as an iPhone 4, the corners are rounded, but not too rounded. The back is a rubber-y soft touch, but not too rubber-y. The button-free glossy black bezel? It's actually a blank touch surface for gestures, like the Palm Pre. A 3-megapixel front camera stares out of the top. For being a beta build of the OS that's not totally optimized, it runs pretty smoothly. Apps open and expand, shrink and close, swoosh in and out as you swish between them without any stuttering. Swiping from the top of the screen brings up the app's menu. From the left or right, switch to the next open application. And from the bottom, it brings up the app switcher, where open apps can be flicked away (kinda like Palm WebOS). Web pages loaded with Flash actually run. It's legit impressive. Update: Last night, RIM co-CEO Mike Lazaridis showed us the WiMax version of the PlayBook running Quake while simultaneously playing a 1080p video with the browser open and a couple of tabs in the background—and it all worked with basically no slowdown. It was definitely a "wow" moment. 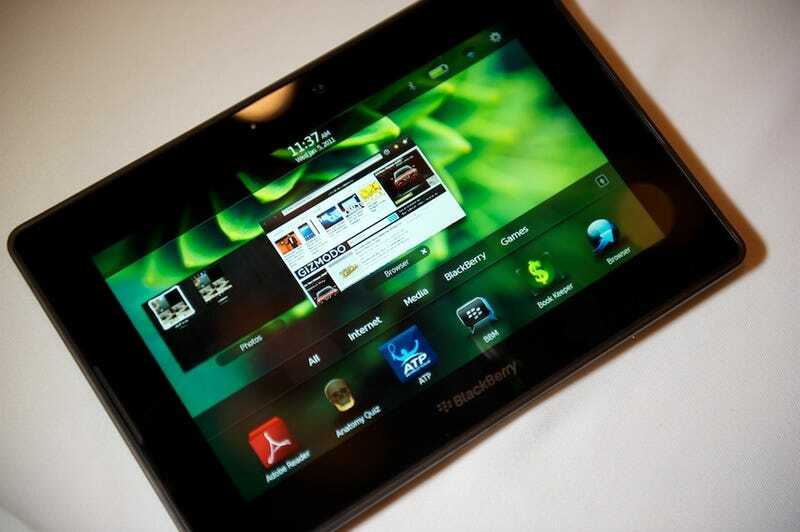 The question is: Who, besides BlackBerry users, is going to want to buy it? The core email and calendar apps are completely tethered to a BlackBerry. Without your BlackBerry, there is no native email or calendar app—just access through the (admittedly good) web browser. But that's gonna turn off a lot of people. And we didn't get a chance to see what the new App World looks like, or any of the future apps that could make it a truly killer tablet—or break it. This form factor is totally going to live and die by the apps, by the that things you can do with it. RIM's smartly giving developers a lot of way into the PlayBook—Adobe AIR, HTML5/web apps (which they call WebWorks), a native SDK (only for special developers), and they can —but how many are going to bite? RIM's got something here that could really stand on top of the bajillion other crappy tablets that are going to launch this year. They just have to take it the rest of the way.